Kim’s summit with Trump has captured intense global attention after a turn to diplomacy in recent months after serious fears of war last year amid North Korean nuclear and missile tests. 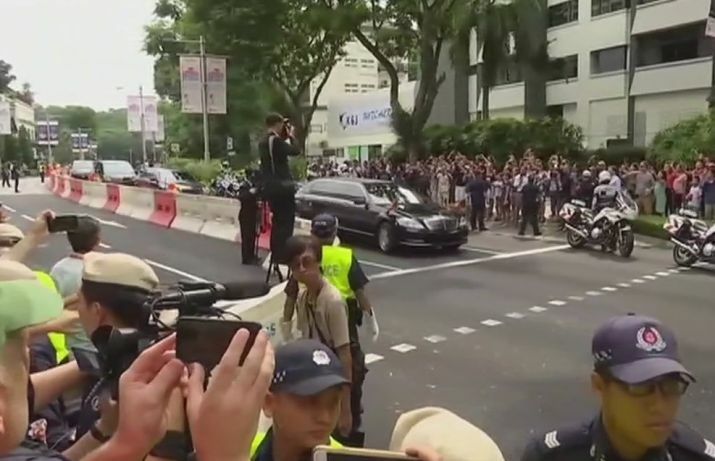 Singapore: North Korean leader Kim Jong un arrived Sunday in Singapore ahead of one of the most unusual summits in recent world history, a sit-down Tuesday with President Donald Trump. The jet carrying Kim landed at the airport Sunday afternoon amid huge security precautions on this city-state island. A large limousine with a North Korean flag was surrounded by other black vehicles with tinted window as it sped through the city’s streets. Kim’s summit with Trump has captured intense global attention after a turn to diplomacy in recent months after serious fears of war last year amid North Korean nuclear and missile tests. The North Korean autocrat’s every move will be followed by 3,000 journalists up until he shakes hands with Trump. Despite the initial high stakes of a meeting meant to rid North Korea of its nuclear weapons, the talks have been portrayed by Trump in recent days more as a get-to-know meeting. He has also raised the possibility of further summits and an agreement ending the Korea War by replacing the armistice signed in 1953 with a peace treaty. China and South Korea would have to sign off on any legal treaty. There has been widespread speculation about Kim’s rare trip out of the North, where he enjoys supreme power. He may be staying at the St Regis Hotel, where China’s President Xi Jinping once stayed. He may be bringing his own armored limousine and bodyguards. A throng of journalists stood outside the hotel. It’s not just the logistics of Kim’s trip that are unclear. There’s a flurry of speculation about what results might come from the summit. It initially was meant to rid the North of its weapons, to forge the “complete denuclearization” of the country. North Korea has said it’s willing to deal away its entire nuclear arsenal if the United States provides it with a reliable security assurance and other benefits. But many, if not all analysts, say that this is highly unlikely, given how hard it has been for Kim to build his program and that the weapons are seen as the only protection he has. Any nuclear deal will hinge on North Korea’s willingness to allow unfettered outside inspections of the country’s warheads and radioactive materials, much of which is likely kept in a vast complex of underground facilities. Another possibility from the summit is a possible deal to end the Korean War. North Korea has long demanded a treaty that may be aimed at getting US troops off the Korean Peninsula and, eventually, paving the way for a North Korean-led unified Korea. The fighting ended on July 27, 1953, but the war technically continues today because instead of a difficult-to-negotiate peace treaty, military officers for the US-led United Nations, North Korea and China signed an armistice that halted the fighting. The North may see a treaty — and its presumed safety assurances from Washington — as its best way of preserving the Kim family dynasty. The ensuing recognition as a “normal country” could then allow sanctions relief, and later international aid and investment. Trump’s supporters have floated the idea that forging such a treaty, which would need a signoff from China and South Korea, would deserve the Nobel Peace Prize. Kim may be interested in getting aid and eventual investment to stabilise and then rebuild a crumbling economy. Just meeting with Trump will also give Kim recognition as the leader of a “normal” country and as an equal of the US leader.